Foie gras is officially banned in the state of California after the Supreme Court rejected the industry’s latest challenge to the ruling. Because of the Supreme Court’s inaction on the matter, the prohibition is finally able to go into effect after years of legal battles. After passing the legislature in 2004, the state law went into effect in 2012. Foie gras producers in New York and Canada, along with a California restaurant operator, challenged the ruling, briefly overturning the ban. The San Francisco-based 9th U.S. Circuit Court of Appeals reevaluated the ban in 2017 and unanimously agreed to reinstate the ban. 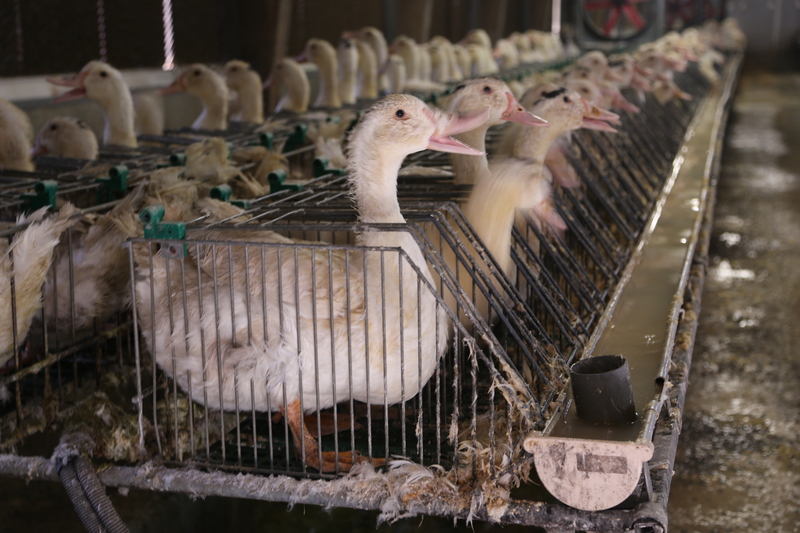 Easily one of the most sadistic things done to farmed animals, foie gras is produced by force-feeding ducks and geese. Workers shove a metal pipe down the throats of the animals, forcing them to ingest more food than they would naturally eat. This process, known as “gavage”, causes the birds’ livers to swell 10 times their normal size. Ducks and geese undergo this cruel procedure two or three times a day, resulting in animals having difficulty walking or breathing and inducing a serious disease known as “hepatic steatosis.” Many animals suffer ruptured organs and die. In fact, this product is so cruel it has been banned in more than a dozen countries. Amazon recently announced that it would no longer sell foie gras in California after violating a law prohibiting the sale, costing the company $100,000. Postmates announced it would no longer deliver foie gras in April of 2018. But the country’s largest foie gras producer is still operating right here in New York State. Multiple investigations by animal rights groups including Animal Equality, Mercy For Animals, and PETA found malicious animal torture including death from force-feeding, ducks hyperventilating as their unnaturally large livers pressed against their lungs, birds with open, bleeding wounds left to suffer in tiny wire cages without proper veterinary care, and fully conscious ducks being shackled upside down and having their throats cut open. One investigation found that a single worker was expected to force-feed 500 birds three times each day. Horrifying, right? What’s worse is the 2013 undercover investigation by Mercy For Animals was filmed at Hudson Valley Foie Gras in Ferndale, New York. Hudson Valley Foie Gras is currently the largest foie gras producer in the United States. Former Senator Tony Avella introduced a bill to prohibit force-feeding ducks and geese in 2017 and retailers like Costco, Safeway, Target, Whole Foods Market, and Wolfgang Puck have refused to sell the egregiously cruel product. It’s time New York City takes a stand. We’re working to introduce legislation that ends the sale of products involving such sadistic farming practices. Help us fight the cruel foie gras industry today.